Step 1: slice thinly 1 medium capsicum & 2 long carrots (makes 1 bowl pickle/achaar). I microwaved the carrots for less than a min. to reduce hardness. Now take them in a bowl. Heat 4 tbs mustard oil or else refined oil in microwave (2 min) or on gas. Add 1/2 tsp fenugreek seeds or methi seeds (option: You may add grounded methi seeds in step 2 instead). 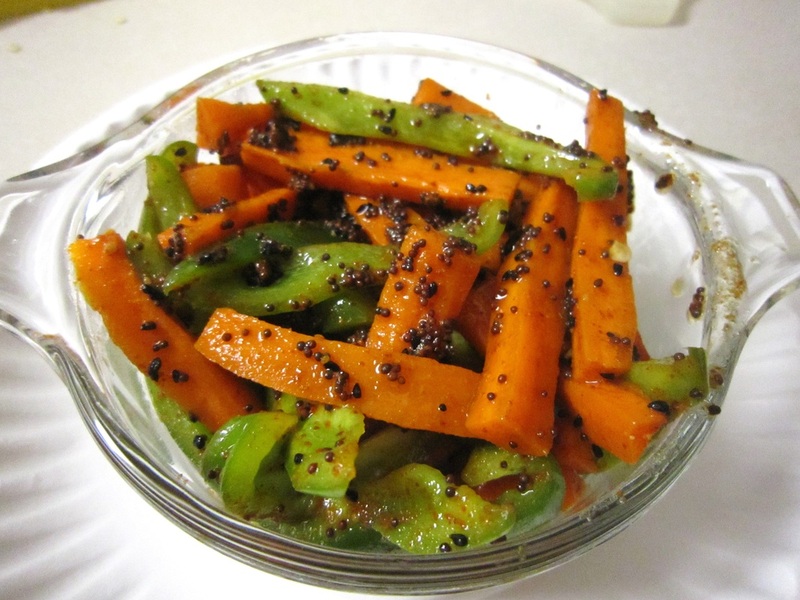 Pour the hot oil over the carrot-capsicum mixture. Cover the bowl & microwave for another 30 sec. Cool & keep outside for a day or 2 so that the juices begin to ooze out & it forms the pickle. Then refrigerate. You may keep it refrigerated in a tightly closed container for up to 3-5 days. I tried this recipe taken from Tarla Dalal & it tasted great after keeping it in fridge for 2 days. The juices really begin to flow out by 3rd day & tastes wonderful esp. with Indian dishes, chappattis or paranthas.